Calow Church of England Junior School Late 1970's early 1980’s. 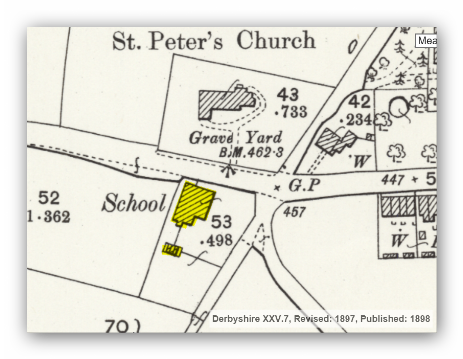 The school was demolished to make way for a housing development in the 1990's. The stone from the front of the building was re-used to build an extension to the rear of the church. I spent many happy years at the school both as an infant and as a junior from 1961-1968. 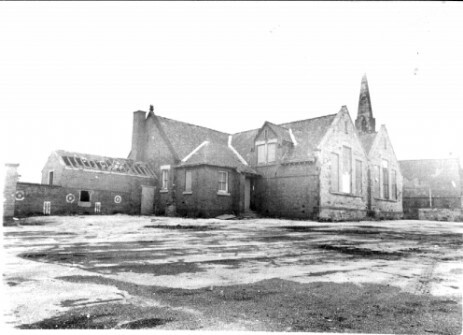 Two new schools, junior and infants were built in the village to replace this building prior to its demise in 1973. The School Canteen where I had many infamous school meals. This building was the last to be demolished as it was used as a boxing club and gymnasium. To the left foreground of the building was a newt pond and small garden. You can also see the school playing field to the left rear of the building. The front of the school from the Church gates. The children's cycles were left over the facing wall for safety and you were only allowed to cycle to school if you had passed your cycling proficiency test. The bell tower housed a bell for many years but I can never remember hearing it although I do remember it being replaced in the 1960's. The canteen, boiler-house and classroom, how well I remember standing in the rain here to queue for my dinner. I can also remember the deliveries of coal for the boiler and occasional days off in the winter when it broke down. This next photograph shows the total dereliction of the site looking towards the church. The toilets were the building centre shot on the old school building with the headmaster's office further up. In my final year I remember cleaning the headmasters Volkswagen beetle for him outside his office. Main School Entrance. Cloakrooms on the left as you went in. Teachers. Headmasters Mr. Cox who retired and was replaced by Mr. Price. Mrs. Gaunt. Mrs. Brimblow. Mrs. Franks. Mr. Curtis. Mrs. Holmes. Miss Webb. The photographs were taken by me and were the very first I ever processed and developed myself. Hence the not so good quality. The class of 1948 included the following. Eric Corker, Graham Bowman, Basil Stone, Brian Whittaker, Michael Sellars, Barry Sharp, Frank Stephenson, Kathleen Fountain, Audrey Taylor Bridget Wilson. Other pupils I remember were Barry Parker Alan Evans Brian Boden,Albert Fox, Marjorie Beebe, Pat Woodhouse, Stuart Whittaker. Mr.Cox was the headmaster then, Miss Cupitt was the infants teacher and she married Mr Franks who taught older children and sport. Other teachers were Miss Bainbridge and Mrs Murton. The vicar at St.Peters church was the Reverend Handforth. Many thanks to Eric Corker.